When quality and performance meet, they are united into one brand name, the Plantronics. As most of you already know, Plantronics is a well-known manufacturer of many different audio products and everything that goes with it. They have quite innovative designs and they never fail to deliver an awesome sound quality. 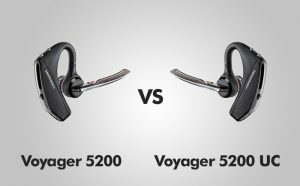 Anyhow, we are here to discuss their two similar, but different products, the Plantronics Voyager 5200 and Plantronics Voyager 5200 UC. Stick with us and see everything about these two amazing headsets. Let’s begin. When we talk about Plantronics Voyager 5200, one thing is certain, this outstanding headset packs a lot of different features that directly contribute to its overall quality. Anyhow, this headset will offer you to drive your car without any problems since it is equipped with the wireless design. Besides that, the Plantronics Voyager 5200 is also one of the most valuable headsets for this kind of thing. Talking to someone with the help of this headset will enable you to use your both hands for different activities which you can highly benefit from. Never the less, let’s see some of the key features that Plantronics Voyager 5200 is equipped with. First of all, this valuable headset is equipped with cutting-edge noise canceling feature. There are four different microphones and a DSP that will cut any disruptive noise that comes from the background of the traffic or crow. Next, there is a pretty convenient WindSmart technology feature equipped as well. Namely, this headset has six layers of unique WindSmart technology that will detect the exact direction of the wind. This will allow the person that you are talking to, to hear you perfectly. Furthermore, this headset delivers one of the best sound qualities that you can find in any other headset. Simply speaking, the HD Voice Clarity will ensure that you have only the best time while talking with someone. It will enhance your speech quality and allow you to hear clearly what the other person is talking about. When it comes to comfort, this headset excels in every field of it. Namely, this headset is rigorously tested for comfort and stability, as well as the durability. This will ensure that you have a comfortable time wearing this headset. Also, you can wear it on your head for a long period of time, that’s for sure. To top it all off, this headset was also tested for the wide range of ears which ensures that everyone will have the most comfortable time. Besides that, you won’t even notice that there is something around your ear with this headset on your head. As for the price, we can proudly say that this one is quite affordable. You don’t have to pay a fortune to own it, but, however, it does cost a reasonable price. Anyhow, with everything that this headset has to offer, you surely will benefit a lot from it. The overall value for the price is massive since this headset holds quite great value for the cash. You can’t possibly go wrong with it. Now, let’s see everything about Plantronics Voyager 5200 UC. As you would suspect, this is a bit different version of the headset that we reviewed earlier. Namely, this is a bundle that has up to four different Plantronics items. There is Plantronics Voyager 5200 Bluetooth headset, charging case, USB dongle, and a convenient wall charger. This means that you actually get a lot of more equipment here, and all of that just to maximize the quality of the product. So, all of these items are quite valuable and they all are pretty convenient which will allow you to benefit a lot. Anyhow, let’s see every feature that this bundle is equipped with. First of all, the range of this amazing headset goes beyond any other. Namely, 98 feet of the range will definitely provide you with the ability to walk around the office or from your car without breaking up on the phone. Second, the ability to talk up to 7 hours is simply amazing. You don’t need to worry about this headset’s play time since you can basically count on it during the whole working time. Also, this is a specially designed headset that allows you to use it for the whole day. Besides that, this headset is also equipped with a four-layer microphone that cancels all the background noise. So, you can easily talk to anyone with this headset and they will hear you perfectly. The comfort of this headset simply is amazing as well. It isn’t any better or worse than the first headset we reviewed which means that it is really good. You can enjoy having these on your head while you are working. It surely is one of the most comfortable headsets that you can find on the market. The price of this bundle is a bit higher than usual, but, you will be provided with a lot of more features and items. It is safe to say that you actually will be able to achieve much more with this headset. Therefore, the price is higher, and, this headset is surely holding quite good value for the price. Let’s see the differences between these two headsets. As you can see, Plantronics Voyager 5200 UC is equipped with more items and therefore, it has more features. However, this doesn’t mean that this headset is better, it only shows the ability for it to provide more. Some people find Plantronics Voyager 5200 just as good as the Plantronics Voyager 5200 UC. Anyhow, the real difference is that 5200 UC comes in a bundle with more items. The price is different as well, but, that is only because the 5200 UC has more things to offer. With the whole bundle that 5200 UC comes included with, you can only benefit more from it. Therefore, the price is higher. However, it is not a drastic difference in price, but enough to show the real difference between these two headsets. As we already mentioned, every product from Plantronics is of the highest quality. Therefore, you can really benefit from both of these headsets, we guarantee it. Anyhow, the choice we leave to you. But, remember that 5200 UC has more things to offer, but the overall performance of the headset is the same as the Plantronics Voyager 5200.